The Gulfstream 280 is one of the most successful super midsize jets produced by Gulfstream. With a range of five to seven hours flight time the it is designed to complete coast-to-coast nonstop flights in a spacious and comfortable seating arrangements. 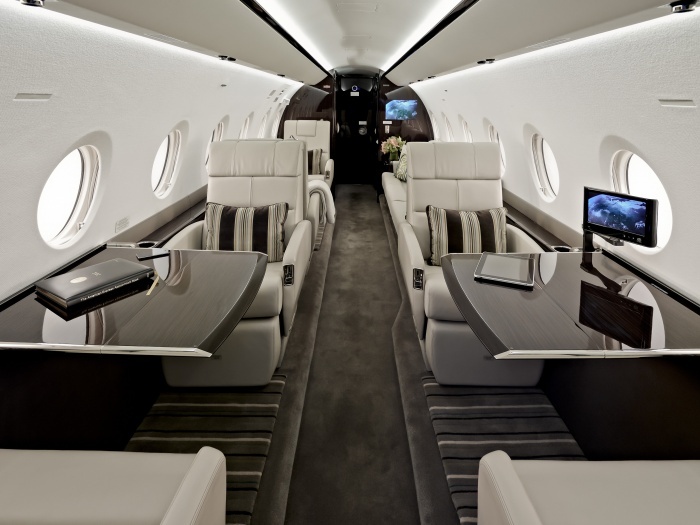 This jet’s spacious cabin measures at a height of over 6 feet, a length of nearly 26 feet, and a width of over 7 feet. This gives passengers ample room to move about the plane and relax comfortably. If you prefer to stay productive or have a meeting, this aircraft contentedly seats up to ten passengers in several different configurations. In addition, the cabin has a spacious an accessible in-flight baggage area and several closets and cabinets that allow for 154 cubic feet of storage space–ample room for suitcases or sporting equipment. With nineteen large style windows, natural light flows in and the sound compression allows for passengers to either rest or work during the flight. The forward galley is comprehensively equipped with a large counter area and a slide out sink cover for more working area. Finally, the aft washroom is one of the largest in its class and has storage area in the vanity as well as a floor to ceiling closet. The Gulfstream represents exceptional value in the super mid-size market for private jets. With a combination of fuel efficiency, luxury and low operating costs, this jet is an ideal choice for your next trip. For more information on chartering a Gulfstream 280, price out your flight here for an instant quote.